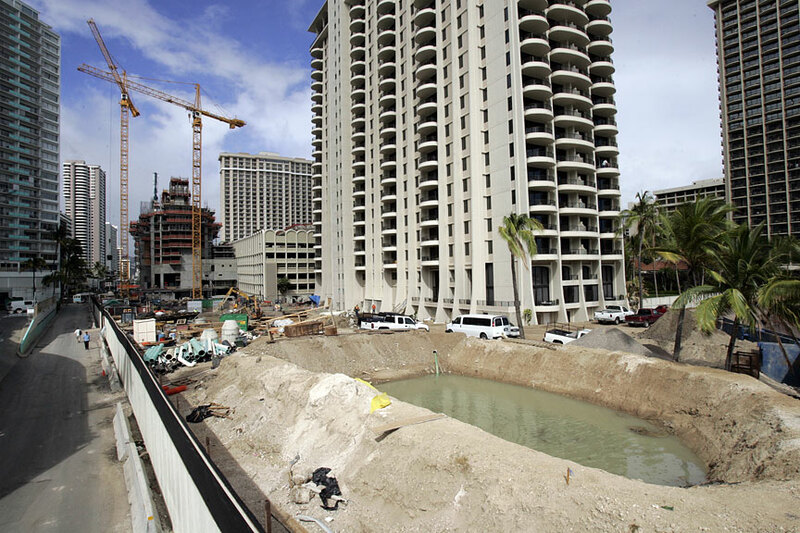 The artificial lagoon at the Hilton Hawaiian Village resembles a mud puddle as construction crews drain the water in the long-awaited renovation project that will be completed in early September. Dirt and rocks cover the area, but Hilton officials envision the day when the public will be able to swim in the Duke Kahanamoku Lagoon, as it is formally known. The previous lagoon was known for murky waters that cycled out once every two days. The new lagoon is smaller and should be cleaner, with water being pumped out at least four times a day. But as the end of the $14 million, yearlong construction nears, nearby residents fear runoff could be contaminating adjacent waters. Over the past few weeks, Sam Monet noticed the water at the Ala Wai Boat Harbor getting murkier from runoff as construction crews drained and dug up the lagoon at the Hilton Hawaiian Village. Monet lives on a boat in the harbor and fears that runoff being pumped from the Duke Kahanamoku Lagoon could be contaminating the harbor. State and city agencies have received several complaints since the beginning of May that the water is milky and has green sludge in it. "We virtually have no clarity now," said Willie Marshall, 62, also a boat harbor resident, as he watched something that looked like oil swirl in the water. "Come high tide, the water is like milk. You can't see anything. It just seems like people use this as a trash can. We don't know what's in the water or if it's dangerous." Les Among, a Waikiki Neighborhood Board member, said he plans to bring these concerns to the community meeting next week to ask officials to minimize the runoff. He said the memory of the massive sewage spill that shut down Waikiki beaches for a week last year is still fresh in residents' minds. "We're concerned about anything that goes into the water," he said. But state and project officials assure residents that the water is nontoxic. Mike Tsuji, the enforcement section supervisor for the state Health Department's Clean Water Branch, said that while there has not been a chemical analysis done on the water, the lagoon did not contain any hazards before construction. For the renovation, construction crews are digging up sediment and then covering the bottom with rocks and sand, creating a 5-foot-deep lagoon. Water flows through three sediment ponds that allow silt to settle before being pumped into the harbor. When the lagoon is completed, water will be pumped through seven saltwater wells that will keep it cleaner than before. After going through the wells, the water will be pumped out to the harbor, said Paul McElroy, the project's manager with Rider Hunt Levett and Bailey. He said the well waters have been tested and fall within the Health Department's safety standards. One of the concerns during construction was whether oil would leak from construction equipment. About two weeks ago, an excavator sank after the driver took the machine too close to the water, McElroy said. Crews pulled the machine out four days later, but the excavator did not cause any environmental damage, he said. 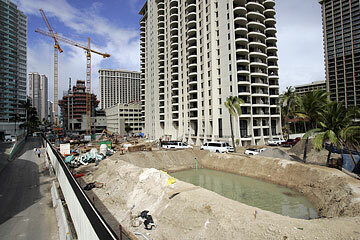 Other construction projects include the Hilton's new Waikikian Tower, retail shops, restaurants and hotel swimming pools scheduled to open in 2009.